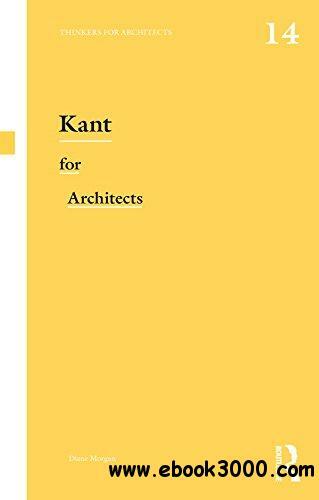 This book introduces architects to a philosopher, Immanuel Kant, whose work was constantly informed by a concern for the world as an evolving whole. According to Kant, in this interconnected and dynamic world, humans should act as mutually dependent and responsible subjects. Given his future-oriented and ethico-politically concerned thinking, Kant is a thinker who clearly speaks to architects. This introduction demonstrates how his ideas bear pertinently and creatively upon the world in which we live now and for which we should care thoughtfully. Kant grounded his enlightened vision of philosophy's mission using an architectural metaphor: of the modest 'dwelling-house'. Far from constructing speculative 'castles in the sky' or vertiginous 'towers which reach to the heavens', he tells us that his humble aim is rather to build a 'secure home for ourselves', one which appropriately corresponds at once to the limited material resources available on our planet, and to our need for firm and solid principles to live by. This book also explores Kant's notions of cosmopolitics, which attempts to think politics from a global perspective by taking into account the geographical fact that the earth is a sphere with limited land mass and natural resources. Given the urgent topicality of sustainable development, these Kantian texts are of particular interest for architects of today. Students of architecture, who are necessarily trained in negotiating between theory and practice, gain much from considering Kant, whose critical project also consisted of testing and exploring the viability of ideas, so as to ascertain to what extent, and crucially, how ideas can have a constructive effect on the whole world, and on us as active agents therein.